I posted this a few yrs. ago on the old forum, but I don't think it made the trip here when we changed servers. There has been some renewed intrest in this process recently, so I thought I'd repost it. Since the original post ,I've found a scource for the Manganese Dioxide at this dealer on Ebay. He also has zinc if you would like the lighter gray color instead of the dark gray that the Manganese makes. I have not found a good retail scource for the phosphoric acid yet, But I will post it when I do. I hope this answers some questions. This process only works on steel parts that have been sand or bead blasted. Usually, if a magnet will stick to the part, you will get good results. The exception to this is stainless steel. Stainless will color very little, if at all. It will have little or no effect on non-blasted, sanded or steel wooled parts. You can remove rust, pitting or other imperfections by sanding, but the repaired surface must be blasted afterwards. The quality of the blasting job will have a direct effect on the quality of the final finish. As with any finish, 90% of the work is in preparing the metal before the final finish is applied. This recipe is repeated for each gal. of solution needed. The original directions said that iron filings could be used but I haven’t tried them. Lathe or mill cuttings may work well too, but the steel wool works great, is readily available and cheap. A stainless steel cooking pot will work as a tank for pistols and other small parts. You can’t reuse them for cooking again, so don’t borrow one from the wife! Garage sales or discount stores are a good place to find one in the size you need. Start with a small tank for pistols and get some practice at this. Once you’ve got the hang of it, you can expand to larger tanks and rifles. This stuff is great on tools too! You will also need a pan of some sort to rinse the parts in. It does not have to be stainless, but it should be something that you won’t reuse for anything else. Disassemble the gun completely. Clean thoroughly. Spray carb. cleaner works great for this. ($.78 a can at Wal Mart) Don’t get any of this stuff on plastic or wood , does nasty things to these materials! A small nylon brush is handy here. After cleaning is the time to make any repairs to the surface of the parts. Most light pitting can be sanded out and burrs around edges can be filed off. Sandblast or beadblast all of the parts that are going into the tank. Do a good, even job on the blasting, and you will be much happier with the results of your finish. The more course/fine grit blasting material you use, the more rough/smooth finish you will achieve. I like to use the very fine white silica sand. It gives the right texture for me. Enough roughness to provide a good grip on any part of the pistol, but smooth enough to be cleaned easily. Bead blasting would likely make a smoother finish, but I haven’t tried that yet. The sand is pretty cheap, and available at most hardware type stores. (Home Depot?) Remember to wear thin rubber gloves when handling the parts after blasting. This prevents the salts from your skin from getting on the parts. Believe me, if you fail to use them, your finished part will have your fingerprints permanently embedded all over them! Immediately after blasting, coat all parts with Rem Oil. I know this goes against all the rules, but it works! Rem Oil is extremely thin and it will cook out during the parkerizing process. It will give all of the parts a consistent shading and protect them from rust between the blasting and dipping stages. Blasted steel will rust very quickly. If oiled, you can blast the parts one weekend, and dip them the next. Mix the ingredients in the tank. Cold water first, adding the acid to the water. Then the manganese dioxide and steel wool. Heat to boiling, stirring often. You want a slow boil with this stuff. Just enough movement of the solution to keep all of the ingredients suspended. I usually let it “simmer” for at least 30-60 min. or until the steel wool is about half way dissolved. You can test to see if it’s ready with a small piece of blasted metal. If you get a good color, it’s ready. Old coat hangers w/o paint on them work great for hanging the parts in the solution. They can also be suspended with cotton string from a bar across the top of the tank, but they must be suspended. Do not let the parts rest on the bottom or touch the sides of the tank or each other. It will leave marks on the parts wherever they touch anything. Fill your rinsing tank with tap water as hot as you can stand to have your hands in, and you’re ready to go! Start dipping! I usually do only a few parts at a time. It’s easier to keep track of things that way. Dip the part for about 5-10 min., then take it straight from the tank to the rinse tank. Using a nylon brush, knock off all the residue from the part and put it right back into the dip tank. Repeat this until you get the color and texture you want. It will get darker and more even with each dipping, up to a point, but you can get lighter colors that will still protect the part. Some parts will come out a slightly different shade no matter what you do, so expect this. 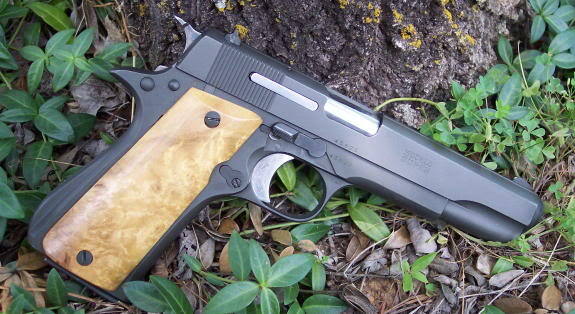 Hardened parts, such as the slide stop on the 1911, will come out a little darker than the rest. I think it’s a nice contrast to the rest of the pistol. It will also work great on color case hardened parts. When you finish the last dipping, rinse and scrub with the nylon brush and towel dry. Let the parts air dry for a few min., coat everything with Rem Oil, and you’re ready to put your gun back together. Reassemble your pistol and make sure to lube everything well. The parkerizing process will “tighten up” most pistols and they will require a slight break in period. That can be a real advantage in a well used gun. Oil the gun a couple more times the first day or so, as the finish will really soak up the oil. The best way to clean this stuff is again, the spray carb. cleaner. It cleans great, evaporates quickly, and will only leave a light dry residue which will disappear instantly when you re-oil the gun. Just remember to remove the grips first. The finish is tough, but will scratch and show normal holster wear the same as a blued gun, but I’ve never noticed any rust around the scratches, and a little Birchwood Casey cold blue will cover the spot and blends in nicely. I have done about 30 pistols and 8 or 9 rifles and 2 shotguns with this process and have been very happy with the result’s. I have a Star Super B and an Argentine 1911 that have had this finish on them for almost 2 yrs. and they have held up nicely. I don’t particularly baby these pistols either. They are two of my favorite shooter’s and see use often. As with any chemical process, take all the necessary precautions when handling the stuff. Wear eye and skin protection. I’m no chemist, but I don’t think these chemicals would be very good to have in your eyes and lungs, or on your skin! Be sure to store them in properly marked containers, and in a cool dry place where the kids can’t get at them. Good luck with your project and let me know if you try this process, or need any further questions answered. Here are the result's I've been getting out of the process. Star Super B, 9mm Luger.